"Oakland three-piece Preening is Max Nordile (saxophone, vocals), Alejandra Alcala (bass), and Sam Lefebvre (drums). 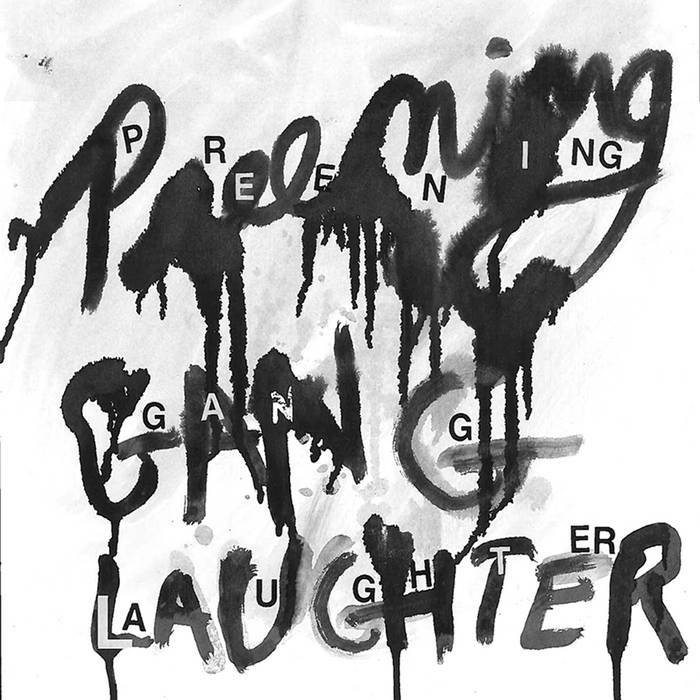 Gang Laughter, mostly recorded in the summer of 2018 by HL Nelly at Santo in West Oakland, is Preening’s first full-length. The album follows three 7”s on labels Ever/Never, Fine Concepts, and Digital Regress, and at least three self-released cassette tapes since 2017. Jackets screen-printed in Oakland by Fine Concepts. “In an effort to ensure that as few people hear them as possible,” “hot new Oakland trio” Preening’s “misshapen angles,” “spittle,” and “occasionally funky” “guitarless no wave” is “an interesting listen” and a “slyly antagonizing joyful noise” that’s “as irritating as anything else in Preening’s discography,” though “I can’t tell if it’s a gag” and “there’s a charm.” Also, “the vocals have a bewildering quality.” -Digital Regress.